Growing research on the effects of gum disease and tooth loss points to the significant toll both can take on an otherwise healthy body. We have already established a strong link between gum disease and cardiovascular disease, for example. One recent study published in the Journal of the American Heart Association finds gum disease and tooth loss are associated with a higher risk of death in postmenopausal women. Keep reading to learn more about the research and what it means for you — from your dentist at Amherst Dental Group. The study from the American Heart Association/American Stroke Association gathered the health information of 57,001 women ages 55 and older. Periodontal disease, tooth loss, and cardiovascular disease are high among this population. Gum disease is a chronic inflammatory disease that affects two-thirds of US adults over the age of 60. Total tooth loss (edentulism) affects one-third of US adults of the same age. Having or having had periodontal disease was associated with a 12% higher risk of death by any cause. Loss of all natural teeth was associated with a 17% higher risk of death by any cause. Women who had lost all of their teeth visited the dentist less frequently compared to women who had their teeth. Risk of death associated with periodontal disease was comparable no matter how often women visited the dentist. Tooth loss and gum disease were not associated with a higher risk of cardiovascular disease. This study was one of the largest to focus solely on postmenopausal women. Previous studies had smaller sample sizes or fewer instances of cardiovascular events. Maintaining solid oral hygiene practices is important for patients of all ages, and studies like this one reinforce the idea that vigilant hygiene and preventive dental attention are especially crucial for aging populations. 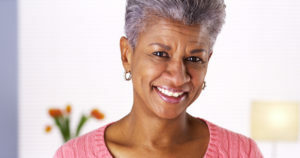 Postmenopausal women may benefit from more intensive oral screenings as well. The team at Amherst Dental Group offers true excellence in dentistry from our state-of-the-art Williamsville office. If you are looking for a “dentist near me” to provide superior general, restorative, and dental implant care, we invite you to contact us at (413) 253-9582.